There are at least a million insect species on our planet, and some experts believe that the true figure is ten times that number. 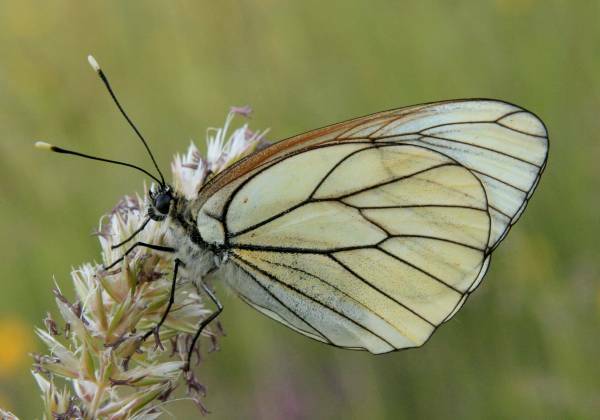 This means that insects are more diverse than all other kinds of animals. Some species swarm in vast numbers - several millions in one swarm; so any attempt at estimating the total number of insects living on earth would need a calculator with a lot of digits! Each image links to a set of pages containing larger pictures, indentification guides and details of food and habitat requirements for each of the insect species within a group or 'order' of insects. Upwinged flies, commonly referred to as mayflies, have long been of great interest to river fishers, especially in springtime. On lakes, however, the sedge flies (also known as caddisflies) are equally important and in some places rather more so. Aquatic diptera too, and chironomids in particular, are a major source of food for lake trout, and so are the nymphs of damselflies in shallow lakes and slow-flowing rivers. But wherever you go, on river, stream or lake, by the time autumn arrives so also do the terrestrial beetles and many other insects - craneflies (daddy long-legs) for example - whose presence is vital for the survival of trout, water birds, amphibians and hence the whole of the foodchain. An arthropod is an invertebrate animal (one that has no backbone but instead is held together by an external skeleton known as an exoskeleton). An arthropod has a segmented body with jointed appendages (commonly referred to as legs, although limbs might be more appropriate, as some of these serve as antennae, claws etc). The exoskeleton of most arthropods is made up largely of chitin and proteins. The name arthropod comes from two Greek words, arthron, meaning joint, and podos, meaning foot - so implying 'jointed feet'. Members of the phylum Arthropoda are classified into systematic groups based on common characteristics, so not surprisingly centipedes (with many 'legs' but not actually 100, but in particular one pair per body segment), millipedes (with many more legs, but again not actually 1000, atached as two pairs per body segment) and arachnids (spiders and scorpions) with eight legs do not belong to the same class as insects, which have six legs. Crabs, shrimps and lobsters (and the many other crustaceans), whose exoskeletons are greatly strengthened with calcium carbonate, are also arthropods. 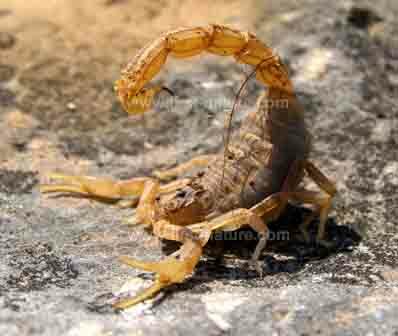 Although scorpions are arthropods they are definitely not insects; they belong to the class Arachnida. Linnaeus divided invertebrates into just two groups, insects (within which grouping he included spiders and crustaceans) and 'worms' - the latter term covering a multitude of spineless creatures, since classified in many phyla and groups below that. Not all invertebrates are arthropods. Earthworms, starfish, sponges, nematodes and snails are just a few of the many kinds of invertebrates that belong to different phyla. A common feature of the arthropods is that the rigid exoskeleton limits their growth potential, so that during development they have to shed skins, each time (called an 'instar') producing an initially flexible and somewhat larger cuticle into which the body expands. It may sound inefficient, because so much chitin and protein is discarded at each moulting stage, but it works: arthropods are by far the most succesful of animal designs, with about a million species described so far and probably at least six times as many still waiting for scientific discovery and description. Also on these pages you will find pictures and information about water bugs, dragonflies and butterflies. We hope you find the photographs and brief articles of interest.